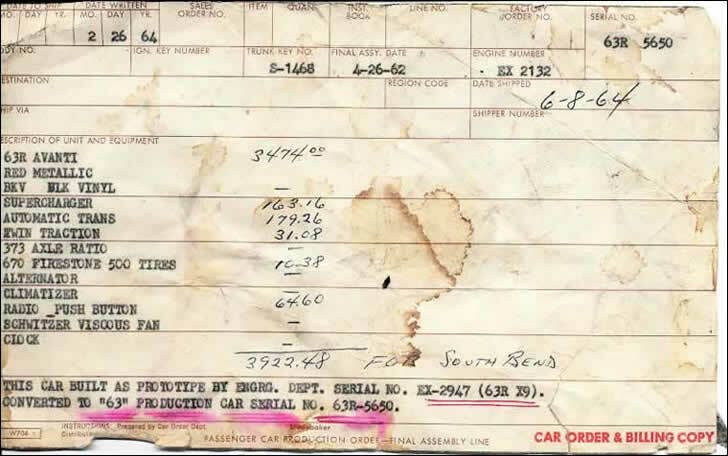 Build Sheets for the 1963-1964 Studebaker Avanti – Build Sheets are one common form of documentation used as proof of a vehicle's initial production status. The original build sheet is a 5 in. x 8 in. form. Some, but not all, of the information will be typed with a 1960s period typewriter, though some items may be stamped or hand written. The build sheet will likely include some, but not all, of the following information: Date to Ship, Date Written, Sales Order No, Item, Quantity, Inst. Book, Line No, Factory Order No, Body No, Ign. Key Number, Trunk Key No, Final Assy. Date, Engine Number, Serial No, Destination, Region Code, Date Shipped, Ship VIA, Shipper Number, Description of Unit and Equipment. Shown at the bottom left of the form in small type is "W704" in a box, and to the right of that is "INSTRUCTIONS: Prepared by Car Order Dept. Distribute as required." At the bottom center under "Studebaker" is "PASSENGER CAR PRODUCTION ORDER – FINAL ASSEMBLY LINE and at the bottom right is "CAR ORDER & BILLING COPY, PRODUCTION RECORD COPY, or similar reference. The vin or serial number on 1963-1964 Studebaker Avantis is embossed on a stainless tag about 2 in. x 3 in. This is found on the top side of the right frame rail directly below the heater blower motor in the engine compartment. Today's long VIN numbers began appearing in the 1980s; 1963-1964 Studebaker Avanti serial numbers are in the format "63R 1004." Cars with an additional serial number in the format "EX-2947" were prototypes originally built for the Studebaker Engineering Department and later assigned a regular production serial number. An unusual Avanti Build Sheet for a prototype car built for the Studebaker Engineering Department and later redesignated "63R 5650" a serial number that is actually higher than the the last production Avanti "64R 5643."